Montana Western's Paige Holmes charges toward the basket against Montana Tech on Tuesday at the HPER Complex. Montana Western's Cierra Lamey scans for a teammate while being guarded by Montana Tech's Kaylee Zard on Jan. 29 at the HPER Complex. Western won the Frontier Conference regular season title for the first time since 2003. Montana Tech's Nia Faletoi drives toward the rim against Montana Western's Darby Schye on Tuesday at the HPER Complex. Montana Tech's Tjaden Pallister, left, and Montana Western's Shannon Worster line up during a free throw attempt on Tuesday at the HPER Complex. Montana Tech's Mesa Williams looks for a chance to pass against Montana Western on Tuesday at the HPER Complex. 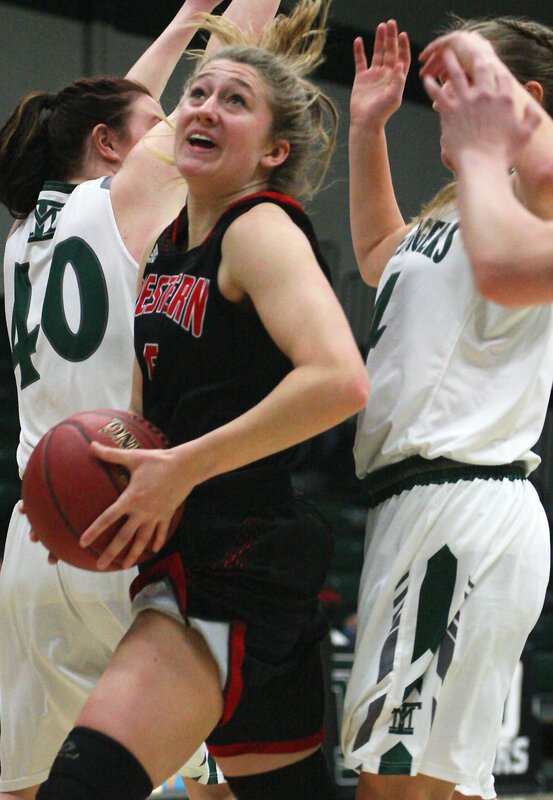 BUTTE — Over the final six minutes and six seconds of the first half, Montana Tech had no answer for the third-ranked Montana Western women’s basketball team. The Bulldogs went on a truly impressive 14-0 run during that span, hitting 5-of-7 shots (including two from 3-point range) as well of both of the free throws they attempted. On the other end of the court, the Western defense forced the Orediggers into 0-of-3 shooting and four turnovers. The run gave them space and despite a few Tech attempts to make the game close, the Bulldogs rolled to a 70-57 win. “We were able to keep them out of a paint and of course we made some tough twos during that stretch,” Montana Western head coach Lindsay Woolley said of the run. “That was probably the best five minutes of defense we put together the whole game. It’s the Bulldogs second win over Tech this year and their ninth in the past five seasons. Tipoff of the game came just hours after Western received what’s believed to be the first-ever No. 1 votes in the NAIA basketball poll. The Bulldogs received two and had 207 points in the poll — just four behind No. 2 Columbia (Mo.) and trailed top-ranked Freed-Hardeman (Tenn.) by 11. Western has been ranked in every poll this year and currently sits at 19-1 on the season. Tuesday’s victory was the Bulldogs seventh in a row and they haven’t lost since an 11-point setback against Providence in early January. Western did miss some easy looks early in the first quarter and at points during the third, but the nation’s top-ranked scoring defense (48.9 ppg) was enough to hold off Tech. The Orediggers managed to pull it back within nine at the 4:30 mark of the fourth quarter, but a bucket out of a timeout from Cierra Lamey right before the shot clock buzzer pushed Western’s lead back to double-digits. Tech missed a shot on the other end, which pretty much put an end to Tech’s comeback hopes. Tech did hit a few field goals and free throws as time wound down, though never was really able to cut into the Bulldog lead. After the game, Montana Tech head coach Carly Sanon was pleased with how her team responded after the early deficit. Western made just three field goals in the third quarter and were outscored 34-27 by the Orediggers in the second half. The loss moves Tech to 12-10 on the year with a 2-9 mark in the Frontier Conference. It was the Orediggers third game in five days and they’ll head to Idaho for a game with Lewis-Clark State on Thursday. Western will also play the Warriors, taking them on Saturday afternoon in Idaho. Brady Bookout with the triple right before the first quarter buzzer. Faletoi can’t get the final shot of the quarter to go. Nice defensive possession by Western. DILLON — In 2016, Cierra Lamey decided it was time to come home.